The Collinsville City Commission met Monday July 21st (at the City Hall Community Room, 106 N 12th Street) for a 7pm regular of the Municipal Authority & City Commission. I missed most of the city meeting so only have results below after the executive session: The re-hiring of City Manager Pam Polk, accepting the Fire Fighters agreement and a short presentation by Rickey Hayes. MONDAY, JULY 21, 2008 AT 7:00 p.m.
A. Approval of Minutes of the June 16, 2008 Regular Meeting, June 23, 2008 Special Meeting/Work Session, and July 7, 2008 Regular Meeting. Notice and agenda filed in the office of the City Clerk and posted at City Hall 5:00 p.m. on Friday, July 18, 2008. 3. Consideration and possible action relating to a request for Commission approval of the Consent Agenda. All matters listed under "Consent" are considered by the City Commission to be routine and will be enacted by one motion. Any Commissioner may, however, remove an item from the Consent Agenda by request. A motion to adopt the Consent Agenda is non-debatable. A. Approval of Minutes of the June 16, 2008 Regular Meeting, June 23, 2008 Special Meeting/Work Session, June 25, 2008 Special Meeting and July 7, 2008 Regular Meeting. C. Approval of Cemetery Deeds: Sharon Evans, 1 space; Millard T. Smalygo Jr., 8 spaces; Daniel or Pamela Lemke, 2 spaces; Vernon Hoffman, 1 space; Robert L. and Patricia Diane Martin, 4 spaces. 4. Presentation and update on the Main Street Program from Maureen Wright, Main Street Director. 5. Request from Carolyn Smith regarding the 63rd Collinsville Tri County Fair on August 21 thru August 24, 2008. 6. Discussion, consideration and possible action on appeal from DG&S Properties Requesting Supplemental Zoning from RS-3 Single Family Residential District And AG Agriculture District to RS-3/AG/PUD, Residential and Agriculture District/Planned Unit Development (PUD-4) for medium intensity single-family residential Uses; located on 85.89 acres at the SE/C of 129th E. Ave. and 136th St. N.
7. Discussion, consideration and possible action relating to a request for City Commissioners adoption of Ordinance No. 819 an Ordinance amending Ordinance No. 606, the Zoning code of the City of Collinsville, Oklahoma by approving CZ-171/Collinsville Planned Unit Development 4; repealing all ordinances in conflict herewith; and declaring an emergency. 9. Discussion, consideration and possible action relating to a request for City Commissioners adoption of Ordinance No. 813, an Ordinance amending parts of Ordinance No. 642, Collinsville Code of Ordinances of the City of Collinsville Part 11, Chapter 4, Section 11-404 by amending Cemetery Fees of the City of Collinsville, Oklahoma. 11. Discussion, consideration and possible action relating to a request for City Commissioners adoption of Ordinance No. 817, an Ordinance amending Collinsville, Oklahoma Code of Ordinances, Section 4-121 by amending the annual license tax for dogs; and Section 4-151 by amending fees for the impounding and caring of dogs; adding fees for disposal or adoption of dogs and veterinary care. Additionally, adding Article F Section 4-175 and 4-176 to Collinsville Municipal Code that establishes fees for the licensing, impounding, caring disposal or adoption and veterinary care of cats; repealing all ordinances in conflict herewith and declaring an emergency. 12. Discussion, consideration and possible action of Emergency Clause pertaining to Ordinance No. 817. 13. Discussion, consideration and possible action on Oklahoma Municipal Water Policy from the Oklahoma Municipal League. A. Discussing personnel matters relating to the City Manager contract review as allowed by O.S. 25, Section 307 (B)(1). B. Discussion, consideration and possible action to enter into Executive Session for the purpose of discussing negotiations concerning an agreement between the City of Collinsville and Collinsville Firefighters Local 3310, Bargaining Agreement, as allowed by O.S. 25, Section 307 (B)(2). 15. Discussion, consideration and possible action on any matter discussed in Executive Session. -- City manager's contract renewed (with an increase) and fire fighters agreement approved. 16. City Manager Report. -- none. Pam Polk deferred her time to Rickey Hayes for a short presentation on retail recruitment which Rickey has been hired to help Collinsville with (along with Claremore, Broken Arrow, Glenpool, Coweta and Guthrie). Hayes now owns his own "Retail Attractions" business but is best know for his retail recruitment results in Owasso the past few years. 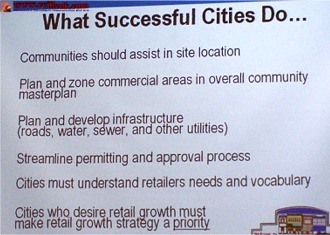 One of Rickey's first goals is to "prepare Collinsville to be attractive to national retailers". 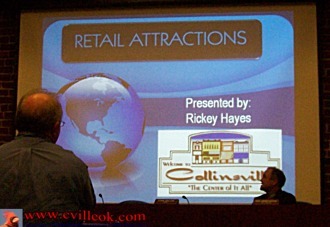 One of the (many) things mentioned to get Collinsville there was a city retail based web site. A sample Rickey Hayes presentation slide above. Ammending for dogs & creating for cats: fees for the licensing, impounding, caring disposal or adoption and veterinary care.